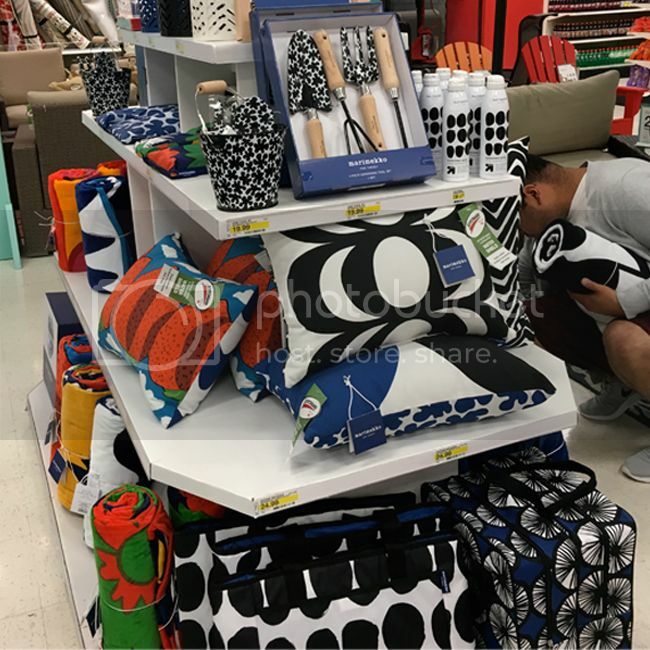 Shopping the Marimekko for Target launch may have made you feel like you were flying high like an albatrossi (albatross) while hunting for an appelsiini (orange). On the other hand, maybe you felt as if you were giving your loved ones a kiss-kiss goodbye. 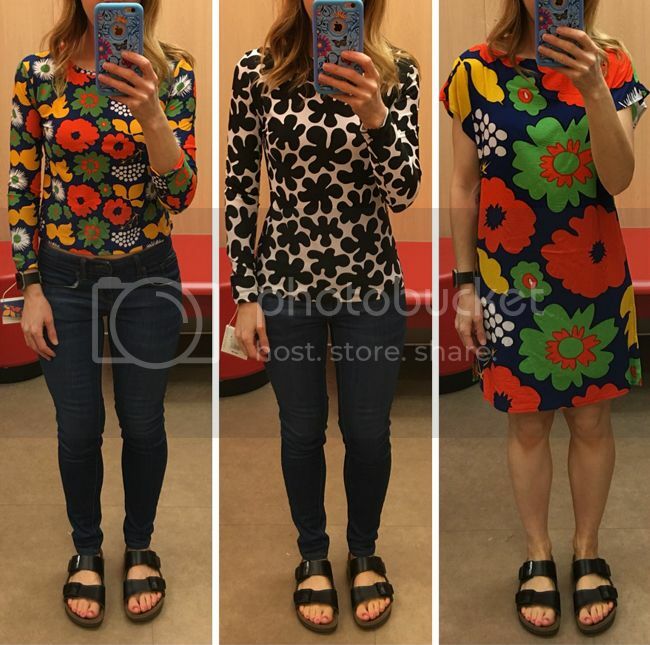 If shopping the collection online or in store didn't make you as happy as a blooming auringonkukka (sunflower), then you might've been hopeless while battling determined Marimekko shoppers who behaved like a traktori (tractor) driving through the mansikkavuoret (strawberry mountains). If you did score your melooni cover-up, koppelo bean bag, kaivo hammock, harka beach tote, ministeri cover-up, kukkatori pouf, or that adorable paprika bikini, maybe you broke out into a triumphant lokki dokie dance to show your excitement. 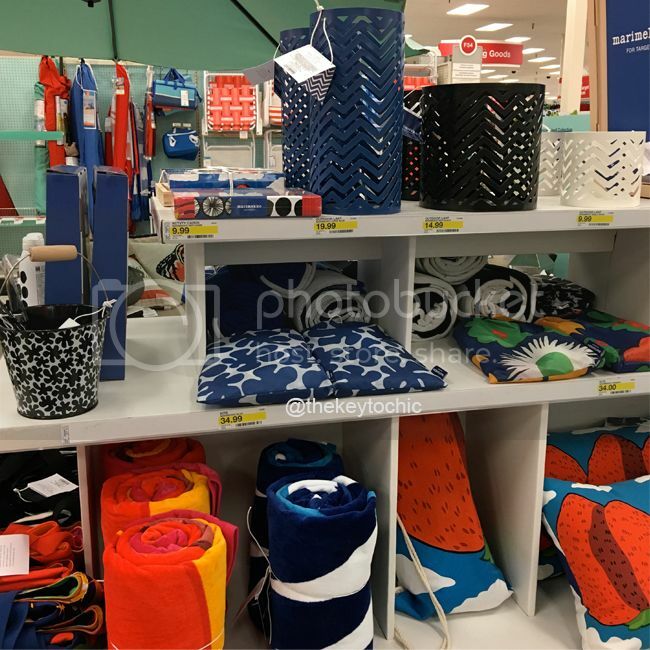 As expected, the Marimekko for Target collection brought out many shoppers but not as many as Lilly. 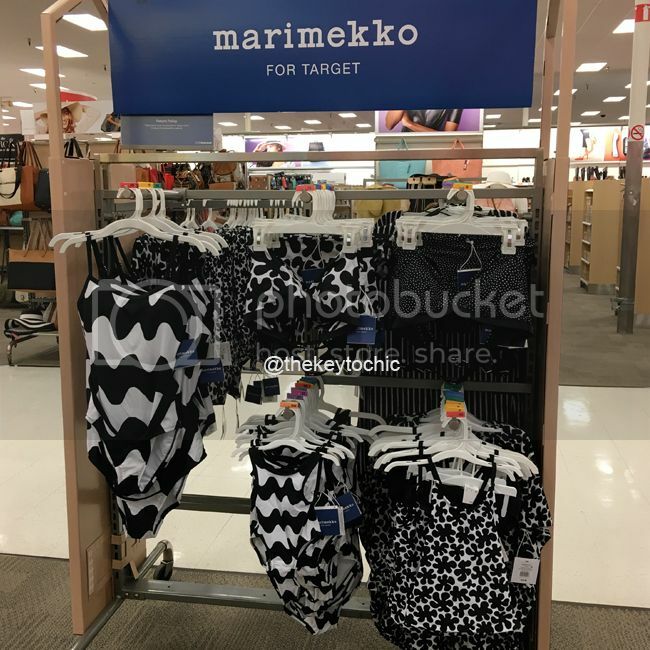 Before you could say Finnish, Target Style, the merchandise began to disappear in stores and online like a meteori flying through the okariino sky. 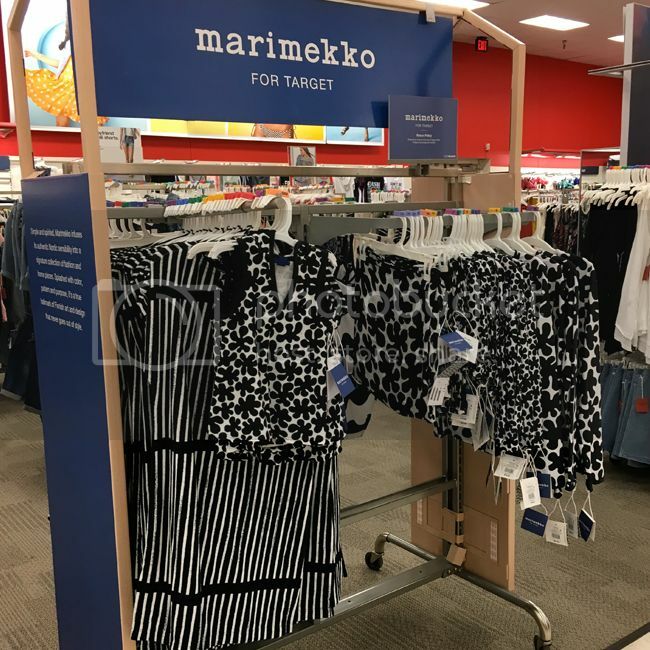 If you shopped with me on Twitter, then hopefully you got all of your Marimekko for Target must-haves, especially since the site didn't go down and the online shopping experience went so much better than the Lilly launch. 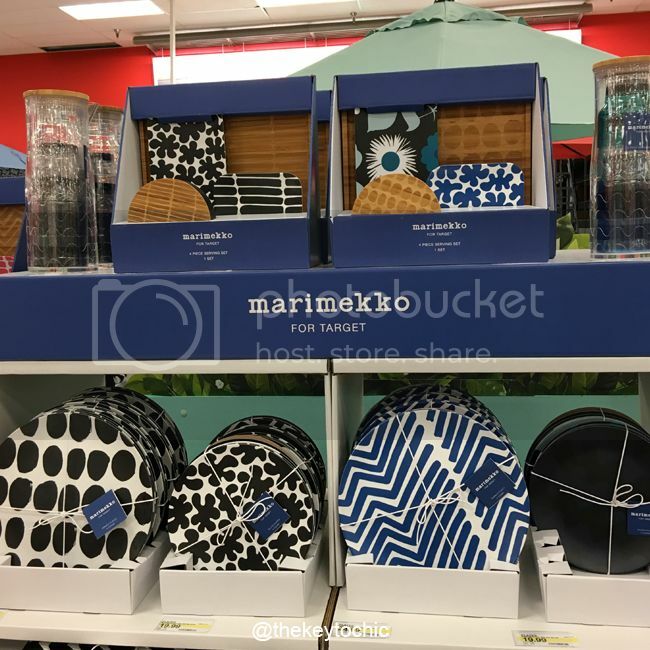 I hope my tips on how to shop Marimekko for Target helped! Read my in-store tip #6 for how to score sold-out items. I arrived around 7:55 am to find only two shoppers waiting. In the next five minutes, about ten more shoppers (men and women of various age groups) calmly gathered near the Target entrance. Upon entering I went straight to the apparel, where the Womens' and Girls' items were grouped together. There were only two racks, unfortunately. I was disappointed to see no kaftans, flip flops or Appelsiini apparel here. The Kukkatori scarf below is crinkly and lightweight, making it a great beach/pool cover-up. 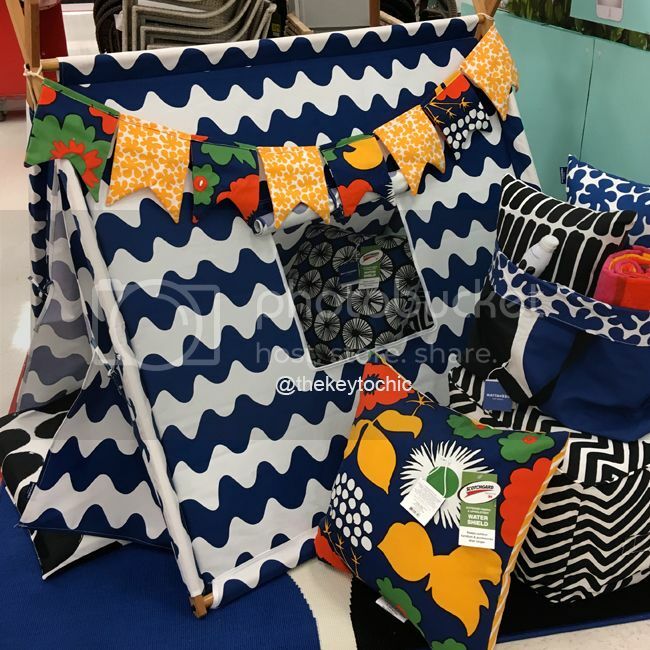 The home and outdoor goods were all placed together in the Garden department in the back of the store. As I approached, I saw a great selection, with placemats and kitchen towels selling quickly. Most items appeared durable and well made for both indoor and outdoor entertaining. 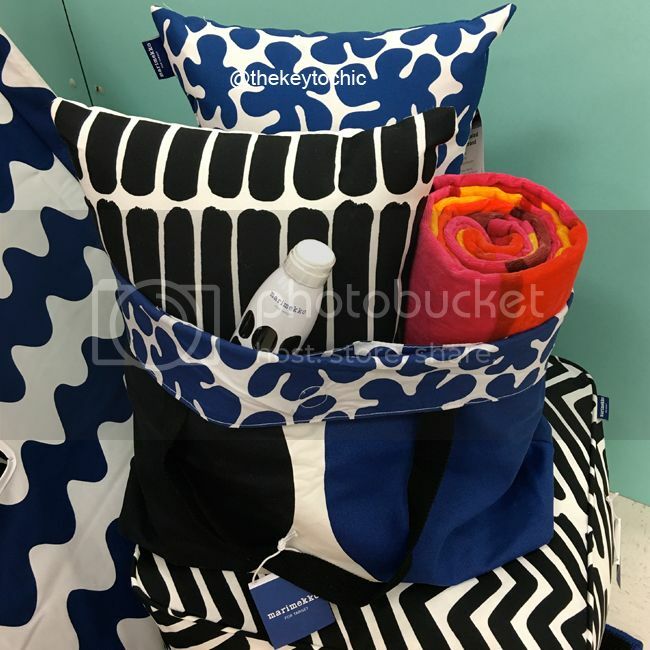 Notes on quality: The beach towels are thick and large, as are the canvas beach totes (which have zip and patch pockets inside, as well as a cute lining). The pillows are of durable quality with Scotch Guard coating. The plates are lightweight plastic melamine (not microwave safe but dishwasher safe). Unfortunately, the kitchen towels did not feel thick or absorbent, so I passed on those. At $9.99, they sold out within minutes in my store. The placemats are thick and seem well made. When I felt the foam body board, it was surprisingly light and nobody seemed interested in buying it at my store. Soon after I snapped the photo below, all the beach totes disappeared. Pillows, kites, poufs, bean bags, and lanterns weren't popular, nor was the tent. Playing hide and seek (and fighting the urge to make up for lost sleep) in the tent below. April 21, 2016 update - Here's a look at the swimwear I got. The bikini top has removable cups but no fastening in back, and the bottoms are reversible to a solid blue. Both run small. The beach towel (which I just washed) is plush but not reversible. It stood up well after one wash, and I can't wait to use it soon! 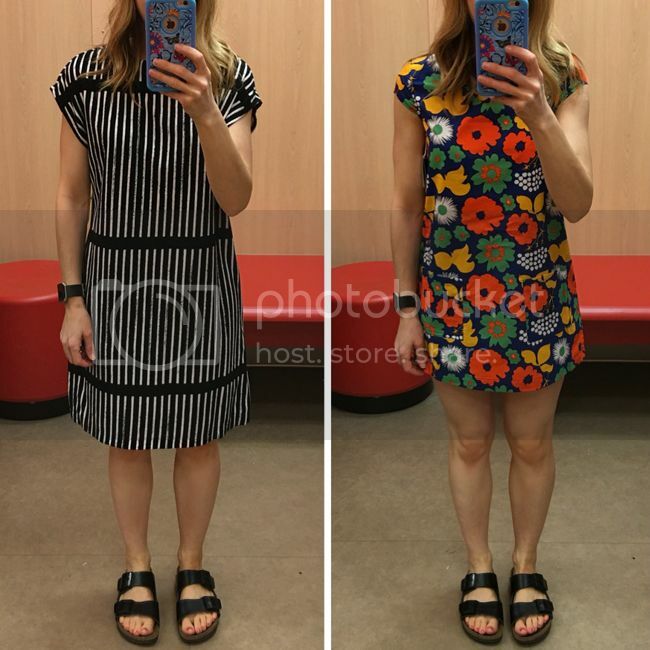 April 23, 2016 update - I received two of my online apparel orders: the appelsiini top runs true to Target's Womens' sizing, as do the appelsiini shorts. I love that the shorts have pockets and an easy fit with an elastic waistband in the back. Both are comfortable and soft rayon, and the top has a boxy fit. For reference, I wear a size XS in Womens' department at Target. I'm a petite 102 lbs. and can usually fit into a Girls' XL at Target. On the left is the Girls' Kukkatori rash guard in XL, which I liked. It's a bit cropped, but felt comfortable. In the middle is the Womens' Paprika print rash guard in XS. It runs a bit small compared to Target's Womens' sizing. On the right is the Kukkatori tunic in XS. It runs true to size. I didn't like the ever-so-slightly shiny texture and unflattering sleeve shape. I did like the side vents and easy fit. On the left is the terry cloth cover up in Ministeri in XS, which had a soft feel. I didn't like the length, sleeve shape or print on myself. On the right is the Girls' dress in Kukkatori size L. They didn't have XL, so I tried L because I was curious about the fit. It has two patch pockets in front, a V-neckline, cap sleeves, a back button, and more structure than the Womens' cover up. It's made of a non-stretchy cotton poplin. See more photos and tips on my Snapchat @thekeytochic. My favorite prints were Kukkatori and Appelsiini. I would've liked to see a wider array of offerings in this collection, such as the bedding and the Unikko print that Marimekko is known for. Perhaps a trendy coloring book, printed mugs, fun notebooks, a colorful rain umbrella, cute sandals or espadrilles, and more tailored apparel for Women? 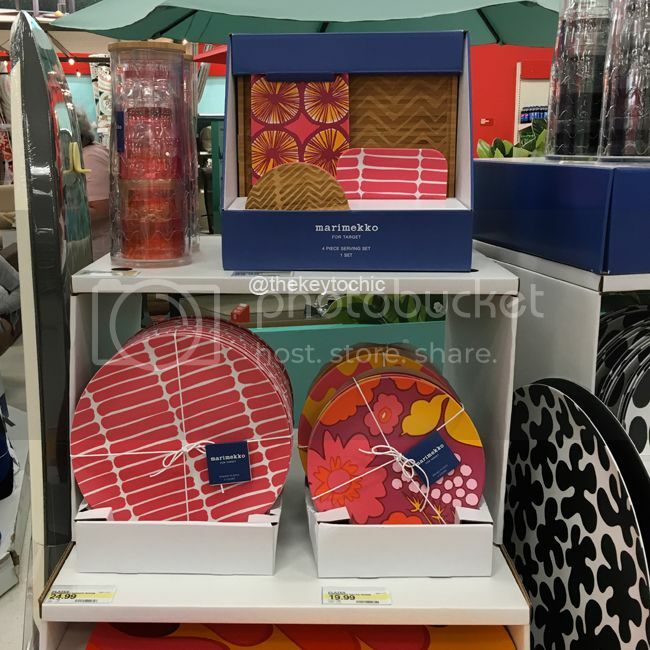 Due to the heavy emphasis on home and outdoor items in this collection (as opposed to clothing, which is my weakness), I didn't have as many must-haves as previous Target capsule collections. 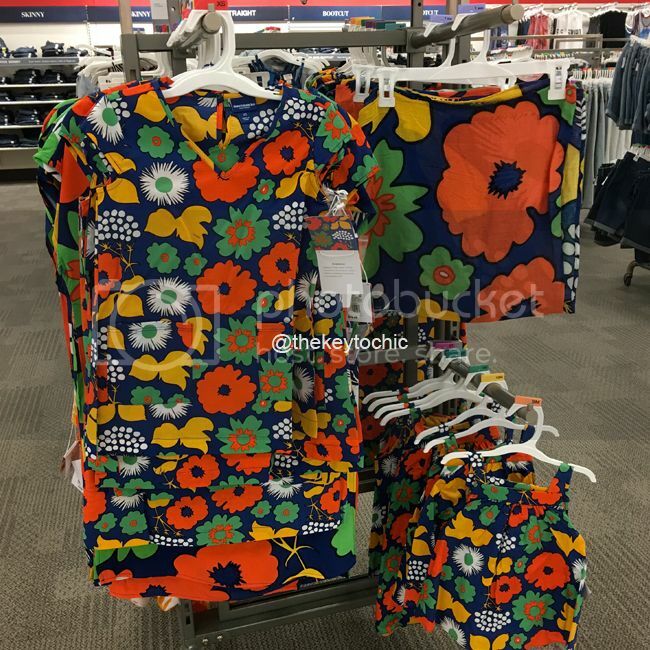 After all is said and done, I'm happy to bring some fun Marimekko prints and colors into my home and wardrobe for spring. 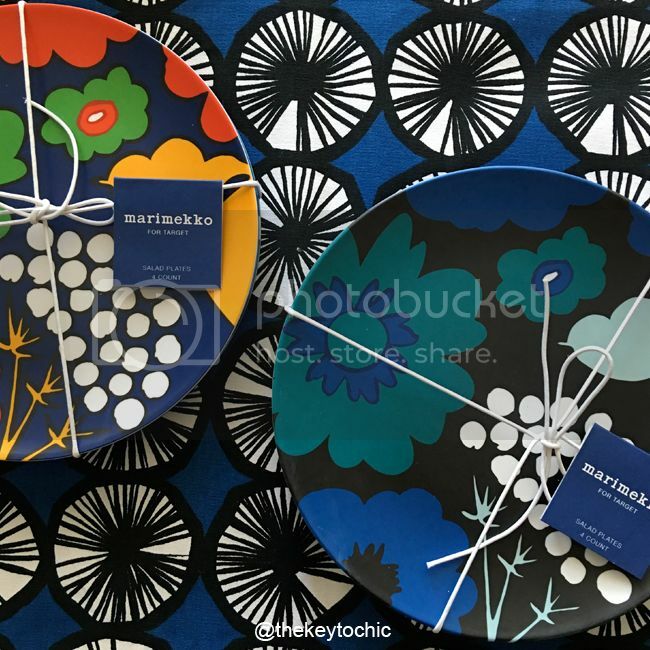 See how I used my new Marimekko purchases on my Instagram. 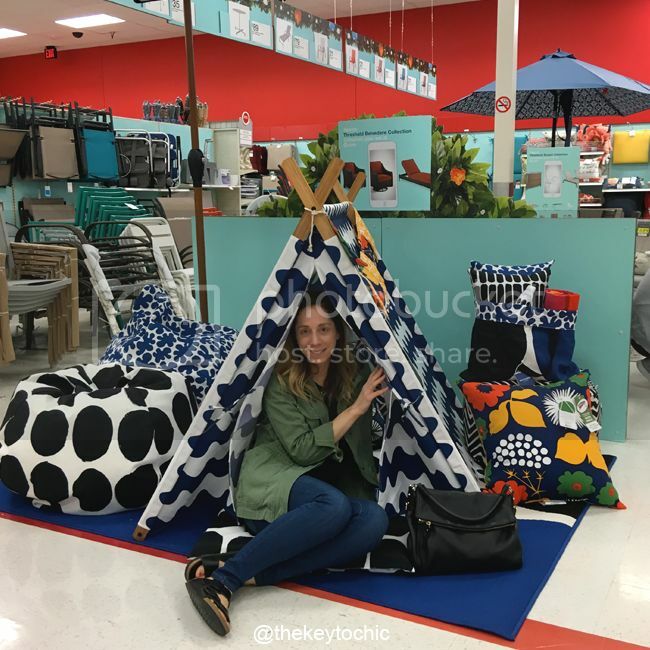 If you've given up on scoring some Marimekko for Target, then don't despair because I've got you covered with some equally stylish alternatives. 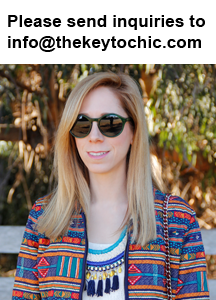 For more shopping and Target Style, catch up with me on Snapchat, Twitter, Facebook, Pinterest, and Instagram @thekeytochic.